when it was first invented by Dr. Washington Wentworth Sheffield, a respected dentist from New London, Connecticut Toothpaste in a Tube Is Born: In the mid-1870s, in between tooth cleanings and dental surgeries, Dr. Sheffield found time to formulate a 'creme dentrifice' that his patients said 'left a very pleasing taste in their mouths,' replacing the unsavory, grainy powders of the time. A short time later, Sheffield's son, Lucius, came back from Paris with the idea to put toothpaste in tubes after seeing the local painters use collapsible ones - and the rest is history. 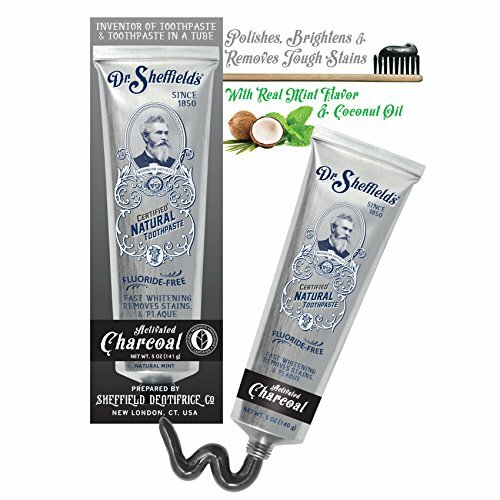 Dr. Sheffield's invention has yet to be surpassed and his natural formulation even more relevant today. When Dr. Sheffield conceived his ready-made toothpaste in the mid-19th century, there were no sweeteners like saccharin or foaming agents like sodium lauryl sulfate. Certified Natural Wintergreen is based on the same historically natural, age-old formula, which Sheffield discovered in the founder's original recipe book from the 1870s. The fresh, mint taste comes from real wintergreen and natural herbal extracts and coconut oil allow its rich, smooth properties. In today's world there's constant exposure to unwanted chemicals. Dr. Sheffield's Natural Wintergreen Toothpaste offers toxin-free daily brushing - no fluoride, no synthetics, no GMOs or artificial flavors, colors, no sweeteners or preservatives. Even without all these additives, it truly cleans, freshens and soothes the mouth - just like it did over 160 years ago.